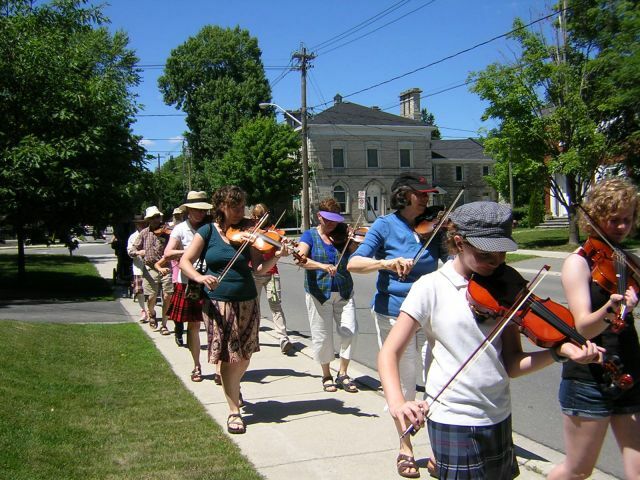 As part of the 200th Anniversary celebrations of the founding of the Perth Military settlement, the Blue Skies Community Fiddle Orchestra will fill the Maberly hall with the heritage sounds of fiddle music Saturday April 23, 2016 from 1 to 6. 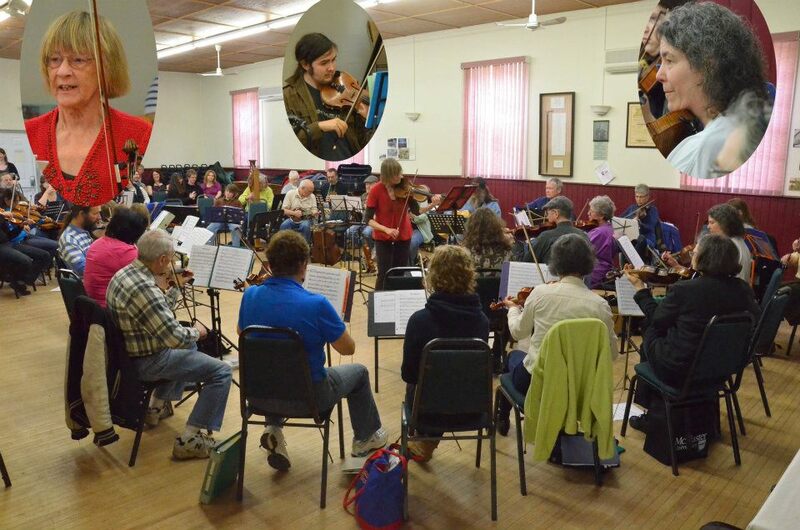 This fundraising ‘Jam-a-thon’ supports the orchestra which is affiliated with the Tay Valley recreation programs in recognition of the important place of fiddle music in our culture. 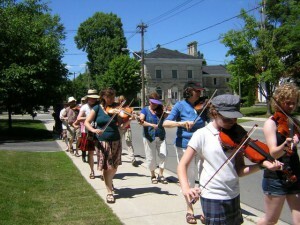 The fifty member fiddle orchestra will play all afternoon and is inviting any local musicians to come and play with them. It’s not just for fiddlers; guitars, cello, viola, mandolin, penny whistles, dancers, listeners and anyone who appreciates home made acoustic music is welcome to join in the fun. Players obtain sponsors, collect the funds and bring them to the Maberly Hall on April 23rd. Participants can drop in and join the jam circle anytime during the day between 1:00 and 6:00pm. 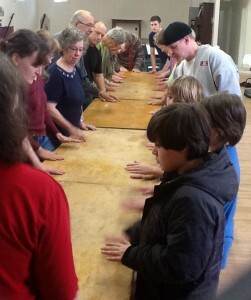 Participants will have the opportunity to choose tunes (or songs) for the circle to play (or sing). Admission is by donation and refreshments will be available throughout the day. The pie auction starts at 4:30 and promises to be a highlight of the day. 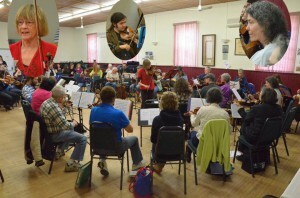 The Jam-a-thon aim is to provide a relaxed opportunity for local musicians to have fun as they play together while raising funds for the Blue Skies Community Fiddle Orchestra. 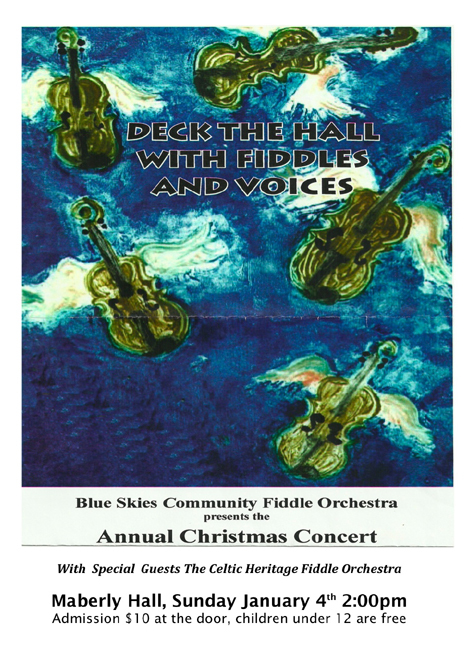 The orchestra is supported by Blue Skies in the Community and keeps our musical heritage alive in our community by making it affordable for anyone to learn to play the fiddle and join in the fun. To obtain a sponsor sheet contact Wolfe at cerlichman@yahoo.com or at 613-273-3986. Hello, I am Wolfe Erlichman, a member of The Blue Skies Community Fiddle Orchestra. generations of musicians in some families and growing in size and community support. 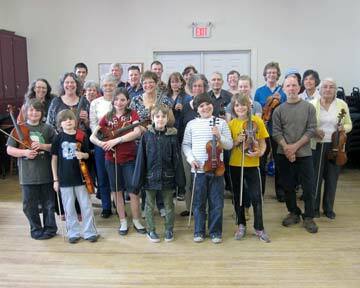 The goal of the orchestra is to foster fiddle music traditions in the community by offering fun and affordable music instruction. Every year we perform in Schools and Senior’s’ Homes, Festivals, Churches, give Christmas Concerts and play at community fund raisers with our fiddles, guitars, mandolins, violas, piano, cello and percussion. This is a tremendous opportunity for anyone in the community who wants to learn a musical instrument and read music, play as a team and follow a conductor. These are transferable skills and a pro-social creative endeavour that enriches all areas of our individual and community life. The multi generational aspect of the orchestra allows for unique friendships to develop based on a common love of music and community. The Blue Skies Community Fiddle Orchestra is an amateur, charitable, non-profit organization. Our main sponsor is Blue Skies in the Community, the registered non-profit charitable arm of the Blue Skies Music Festival. These dedicated volunteers support the conductor and the purchase of sheet music, and maintain an instrument lending library, which rents fiddles at a nominal cost so that all families or individuals have access to this orchestra. Over the past decade we have been actively involved in fund raising and appreciate the community support we have received. Our orchestra has grown significantly. We are planning a Trip to PEI in the summer of 2015 to learn the traditional music of the Island, perform at local events and bring our “Local Music” to their Community. We hope you will be able to support us to continue to contribute to the culture of our Lanark and Frontenac Counties. Thank you for considering our request of sponsorship or donation.